Two conservationists have been arrested today at Butlers Gorge. The pair had been blocking access to a logging road that leads to three separate logging operations in an area nominated for World Heritage. The conservationists had locked themselves to each other and sat down across the road early this morning. About 10 police were at the protest and police Search and Rescue removed the protesters at 12:30pm. 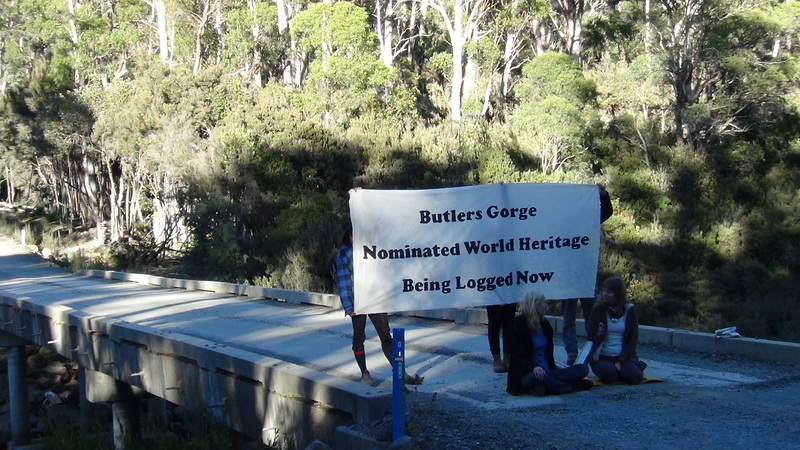 “Today’s peaceful protest has once again highlighted the ongoing destruction of Butlers Gorge. This area is significant habitat for endangered species and native wildlife. Still Wild Still Threatened have collected video evidence of Tasmanian devils and spot tailed quolls within Butlers Gorge and we are calling on Tony Burke to take action to protect these forests” said Ms Gibson. “Two dedicated conservationists have today been arrested in order to bring attention to the hypocrisy of the Australian Government, who are allowing this logging to continue despite nominating these forests for World Heritage” said Ms Gibson. “Minister Burke as a responsibility to protect the habitat of these endangered species and to protect these forests that he has nominated as World Heritage. We are calling on the Minister to enact Section 14 of the Environmental Protection and Biodiversity Conservation Act and bring an end to the destruction of these forests” said Ms Gibson. Posted on March 5, 2013, in Media Releases. Bookmark the permalink. 4 Comments. Is Tony Burke really an Environment Minister? Oh well, it’s an election year.